Three people were arrested in the small fishing village of Gangjeong, on the island of Jeju, South Korea. In response to the announcement that the national assembly passed the 2013 budget for the construction of a vast naval base, peace activists organised a direct action to make their frustrations heard. For the past five years, villagers and peace activists from all over South Korea have been fighting the decision to build a naval base in a UNESCO biosphere reserve. Since construction started in 2009, protesters have been blocking the entrance of the gate day and night, and every hour about 300 police descend upon them to clear the way for the cement trucks to enter the site. 589 activists have been arrested so far and 493 people charged. Currently there are 8 people in prison related to Jeju naval base charges, among them a Protestant pastor and a Catholic priest. During the daily three o’clock Protestant service outside the gate, protesters blocked both entrances with cars and people chained underneath them. On top of one car an activist wearing barbed wire chained himself to the roof. It did not take long for the police to arrive for the hourly clearing of the gate. In a swift action, three protesters were arrested and peace activists, including Protestant pastors and Catholic priests and nuns, roughly pushed and held aside. A few kilometres away newlyweds and tourists from around the world spent an idyllic vacation in huge luxury resorts unaware of the struggle close by. Every year more than 4 million tourists visit the subtropical volcanic island of Jeju, about 80km from the Korean mainland. The island, which is known for its unique nature and biodiversity, is part of the new seven natural wonders of the world. The island was awarded the designation of UNESCO Biosphere Reserve in 2002, UNESCO World Natural Heritage in 2007 and UNESCO Geopark in 2010. The coast off the small fishing and farming village of Gangjeong, in the south of the island, was designated an ‘absolute conservation zone’ in 1991 and, in 2002, a UNESCO biosphere reserve. The sea off Gangjeong houses rare soft coral and is one of the most important habitats for the endangered Indo-Pacific bottlenose dolphin. To start the construction of the naval base, however, the governor of the island revoked the distinction of ‘absolute conservation zone’ in 2009. The 1.2 kilometre long Gureombi rock where the 49 hectare naval base will be located, does not only have a high natural value, but also a high spiritual importance for its residents. Although 94% of the inhabitants voted against the base in a referendum, the ROK government and the military refused to accept this result. “Before, this was a peaceful village,” mayor Kang Dong-Kyun says. “But the construction of the naval base has completely ignored democratic values ​​and has sown mistrust in this village”. The government is trying to sell the base, which once finished will be able to house 20 warships and two 150,000-ton cruise liners, as eco-friendly. They have assured that the impact on the environment would be kept as low as possible. Many villagers and peace activists, however, find this statement troubling and wonder how the covering of the rare coral reef with cement will help preserve the area. 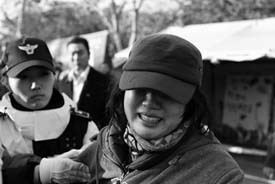 The inhabitants of Gangjeong also fear for their livelihood, the loss of their family heritage and the general welfare of the village. Most of the villagers are farmers and fishermen who live off the wealth of the earth and the sea. The small harbour, which was formerly used by the fishermen, is now already off-limits. The Seoul government is of the opinion that the inhabitants were properly financially compensated, while many villagers feel put under pressure and believe they were not given an alternative for the sale of their land. Many want to preserve their culture and traditions and know that the jobs that normally accompany military bases are more likely to be in bars and brothels. Desperation among the villagers is high and, last year, a villager drank pesticides in a failed attempt to kill himself. The Seoul government stresses that a naval base in Gangjeong is essential for the control of the military and civilian maritime traffic in the surrounding waters. Southwest of Jeju also lies the Ieodo reef, on which the South Koreans have built an underwater research station. However, China also raises claims to this reef. Both countries believe that valuable raw materials are slumbering below the seabed. Gangjeong is located 500 kilometres off the coast of Shanghai, the economic centre of China. Most people here agree that the naval base is being built because the South Korean government has been put under pressure by the United States. Even if the ROK government insists that the project is not built to accommodate the needs of the United States, they had to admit that the U.S. Navy, due to the mutual defence pact, has the right to use all ports and airports in South Korea. The presumption in Gangjeong is strong that the naval base will serve less as a shield against the main enemy, North Korea, but as an outpost of the U.S. Navy to keep the rising economic power of China under control. Since the Korean War (1950–1953), the United States is still the main military ally of South Korea and 28,000 U.S. troops are stationed here. People in Gangjeong are worried that the base is likely to trigger a confrontation and an arms race between South Korea and China, with the almost inevitable involvement of the United States. The last time Jeju hosted a military base in 1948, 30,000 people were killed, 40,000 houses burnt down and 90,000 people made homeless (with a population of 300,000 at the time), as the government sought to quell an uprising led by a small group of alleged communist insurgents. Only in 2003, President Roh Moo-Hyun officially apologized and declared Jeju an “Island of World Peace”. It is this appelation that the protesters use in their struggle against the base. “We do not understand why Korea needs another military base, especially in an area of such high cultural and natural value. There are already more than 100 military installations in South Korea, and we do not believe that this one more base will increase security for the country. Jeju is an island of peace and we want to keep it this way” a protester said after the police raid. One hour after the arrests, peace activists were back blocking the gates. Carole Reckinger publishes a photo blog that she is updating daily during her stay in Gangjeong.